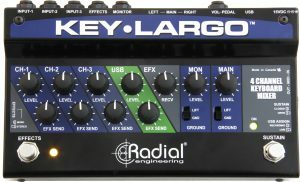 Switches the effects loop from stereo to mono when pushed in. 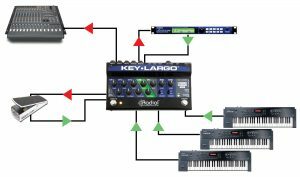 Latching footswitch turns on or off the effects loop. 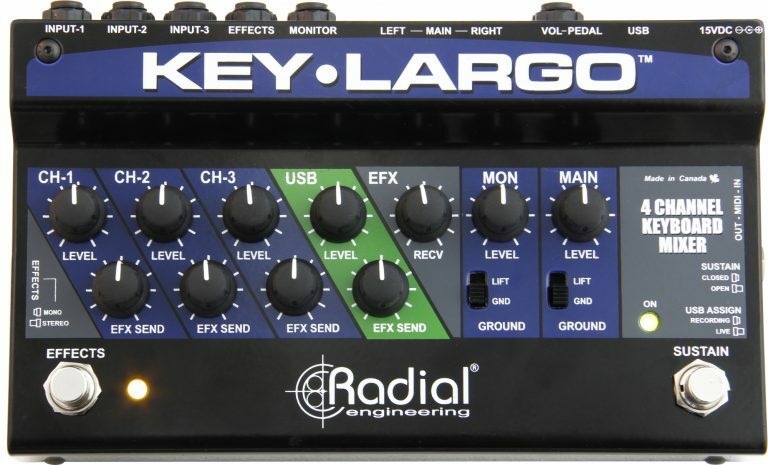 Adjusts the input levels of your three analog keyboards. 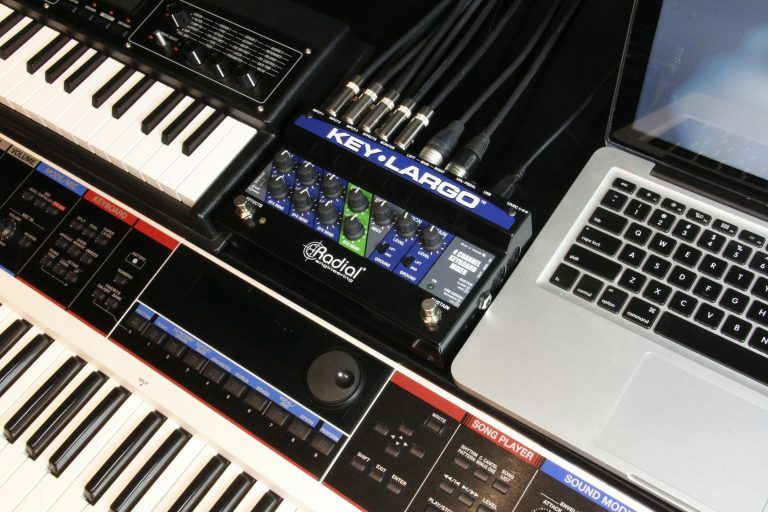 Individual controls on each channel are used to set the desired amount of effect that will be applied to each device. Used to adjust the USB audio return from your laptop. 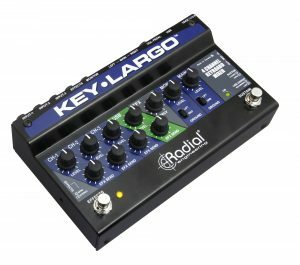 Master effects return control, used to optimise the effects loop signal path. 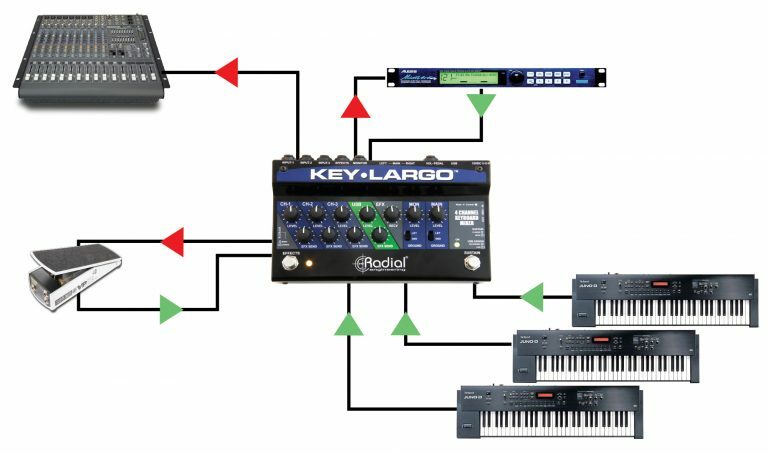 Adjusts the stage volume for the keyboard monitors. Helps eliminate hum and buzz caused by ground loops. 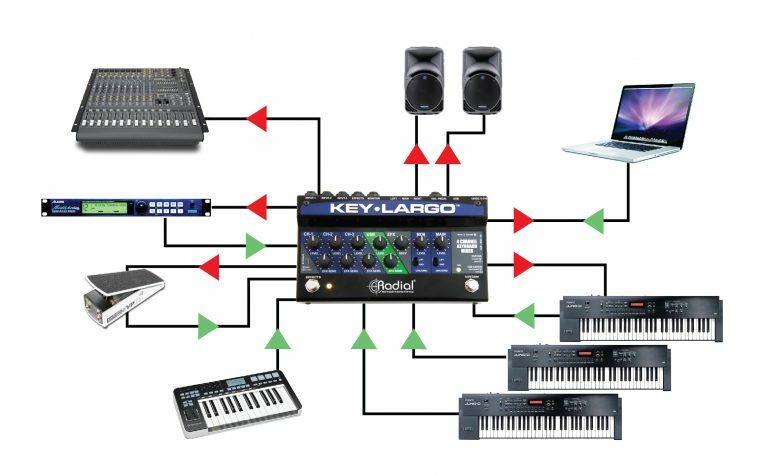 Sets the Key-Largo output level going to the PA system. 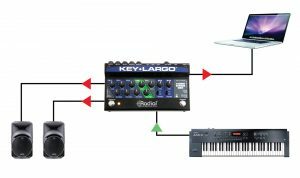 Momentary footswitch activates the sustain function on a master keyboard or digital piano. IN & OUT connections to send and receive MIDI over USB. 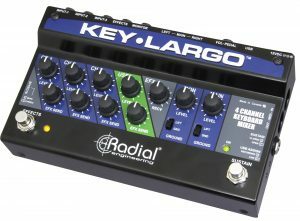 Enables the Key-Largo sustain footswitch function to work with various keyboards. 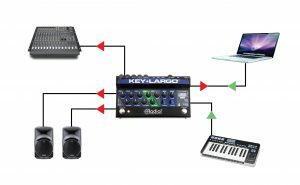 Configures the Key-Largo for live performance use or as a recording interface. 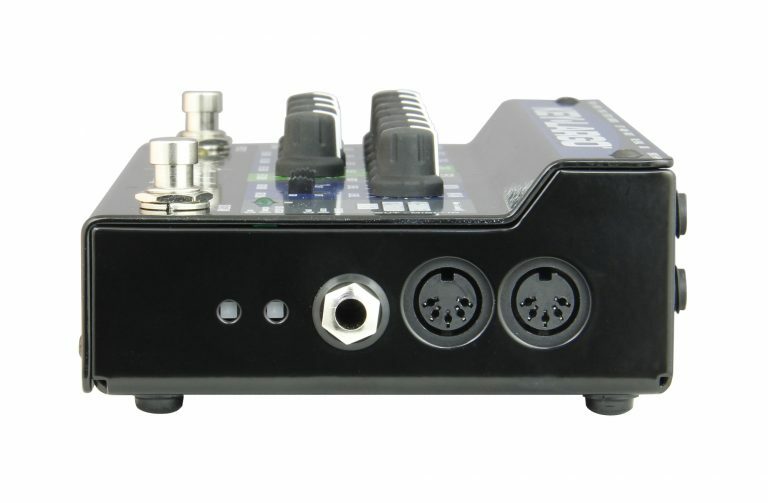 High quality USB I/O for Mac or PC. Stereo TRS insert for a master volume pedal. 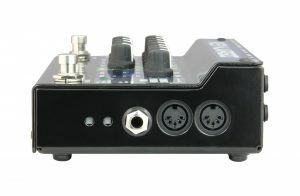 Stereo XLR balanced outputs are used to feed the PA system - transformer isolated to eliminate ground loops. 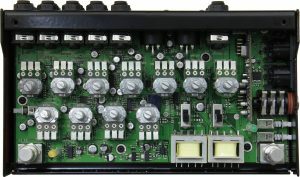 Stereo ¼” TRS balanced outputs are used to feed a pair of self-powered speakers for on-stage monitoring. Insert jacks used to feed an external effects device. Connects your analog keyboards to the Key-Largo. Connect the Key-Largo sustain footswitch to your keyboard or digital piano. I-Beam construction prevents circuit board from torque which could lead to part failure. Keeps your Key-Largo looking good for years. Steel casing with steel shaft and retention nut that will not bend when under stress. 100% discrete Class-A circuitry for minimal negative feedback and the most natural tone. 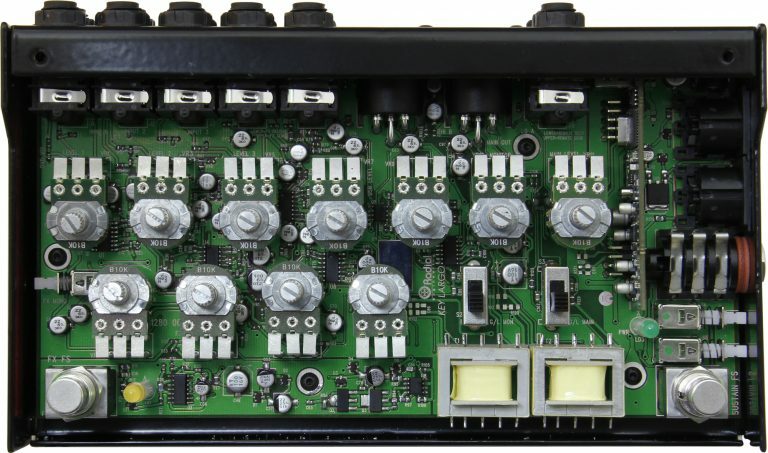 Custom 1:1 isolation transformers for distortion-free signal transfer. 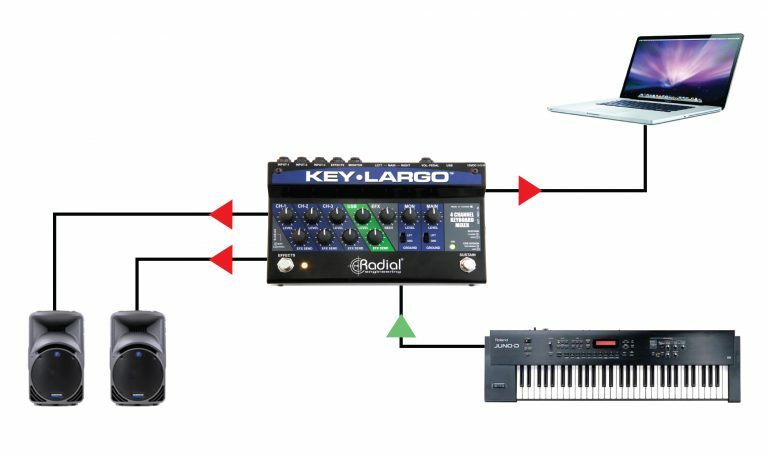 Full ground plane for noise-free performance. Double sided through-hole solder points for durability.